Wood grain provided by Bud Guinn (modified by Bill Richardson). Mitered corners were automated by Lemos Pinto. Download & Installation Instructions: Please note that the action has only been tested for Adobe Photoshop Version 7.0. It might work on lower versions but it has not yet been confirmed. All tested versions will be posted on this page as soon as results have been confirmed. 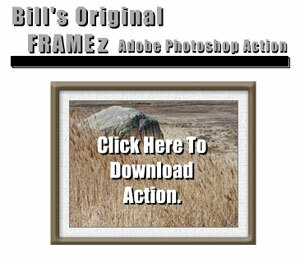 The download of the Frames Action is extremely fast due to the small compressed file size. The name of the file is: framez.zip. The framez.zip file must be unzipped to extract the action file named FRAMEz.ATN. There also includes a file named frameinstruct.txt that has the same instructions displayed on this page. If this is an upgrade to an earlier version of the Frames Action, delete the old action version from the Adobe Photoshop action menu. The FRAMEz.ATN file must be placed in the Presets/Photoshop Actions folder that is located in the Photoshop program folder. Click on Photoshop Help ---> Search ---> and enter "action" for the searched word. The Adobe Photoshop section entitled "Saving and Loading Actions" explains the exact location and procedure for the action file depending on the type of operating system you are using. In the Adobe Photoshop Action Window, click on the little circular arrow located in the top right hand corner of the window. Select Load Actions and then select the file FRAMEz.ATN. The new action will only be displayed if you copied the FRAMEz.ATN action file into the correct directory. Quick Action Use Instructions: Please DO NOT send any email questions to Outdoor Eyes regarding the installation or use of the Frames Action. Thank you. The following instructions also appear to guide you through the process when you are using the Frames action. 1) Open your image and change the resolution of the image to the recommended resolution of 72 pixels. Make sure the image has the correct height and width size. Note the height and width of the image in pixels as it will help you during the sizing steps of the matte and frame. 2) Click the right arrow next to the Frames Action to display the complete action. Clicking "Start Here" will highlight that selection in blue. Click the play selection button. 4) The matte will be created first. Hint: Be sure to create a large enough matte so that the finished product will look like a piece of artwork. Look at some artwork on your wall and you will see that mattes are much larger that the frames. Based on the size of the image, enter in a matte size that will be consistent with the image. 5) Choose a matte color by using the color selector. Most mattes look professional in white, so if this is the first time using the action, use the default color white. The opacity can also be changed. 6) There are options for the type of matte texture. There are at least 4 textures available: Brick, Burlap, Canvas and Sandstone. If more textures have been added to your Adobe Photoshop, you will have other choices available. If this is your first time using the Frames action, select Canvas for the texture. The opacity can also be changed if a color was added to the matte. 7) The frame width (horizontal and vertical) is the next option. The same number must be entered for both vertical and horizontal. The maximum size for the width of the frame is 400 pixels. Hint: Based of the size of the matte, choose a width that is much less than the size of the matte. 8) The frame is created and a history thumbnail snapshot is taken to allow you to return to this stage to try different a different frame choice. When your frame has been completed, you can click on the thumbnail snapshot to select a different frame choice. Choose a type of frame. The frame choices available are: Rosewood, Curly Wood, Oakwood, Pine and Pattern. Highlight a choice and click the Play Selection button to continue. 9) The frame adjustment adds an inner shadow to the frame, while the hue and level adjust the color and the contrast of only the frame. 10) The bevel adjusts the frame bevel and shadows on the frame. You are now done. 11) Select the history window and click on the saved Snapshot 1 thumbnail. Select the actions window and choose a new frame type (go to section 8). 12) You will only learn by doing and experimenting and the Frames Action is a very powerful addition to your Adobe Photoshop.